Essentially music which has maintained its identity through generations of players. Traditional music is associated with regions, but also follows migration patterns, adapting in the process. For example American Bluegrass draws from celtic music and blues, with a distinctive result. Overlap between traditional music, world music and folk music is substantial. 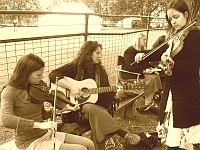 However world music is generally from non-Western countries, folk music is often associated with popular American and English acoustic music from the 1960s and beyond. By definition, original songs and tunes are rarely added to traditonal music repertoires. However highly original arrangements of traditonal music abound. You will find some on this site.